Legion of Frontiersmen of the Commonwealth, Edmonton, Canada. May 2002. 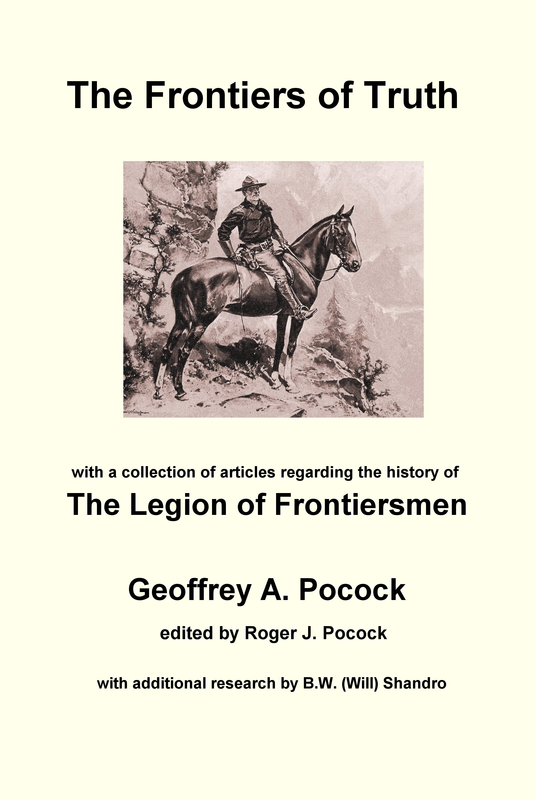 The Calgary Command of the Legion of Frontiersmen was established in 1912. By this time the British Empire was on the verge of war and the newly formed command was organizing for this eventuality. Citizens of this community were concerned that the Imperial centre, London, England was prone to attack by German “airships.” These new airships could inflict incalculable damage on a defenceless city. In 1913 the patriotic citizens of Calgary, a former North West Mounted Police outpost on Canada’s vast western prairie, started a fund to purchase an airship “The Calgarian” for the defence of the “motherland.” Very likely, many Frontiersmen supported this effort in principle and through donations. Not to be outdone, the Legion of Frontiersmen took the proposal further, advocating the building of airships in Calgary and training of “aerial scouts.” No doubt the local construction of an airship was soon judged to be beyond the capabilities of an emerging pioneer community. The concept of the “aerial scout” and the idea of training men for air service was at the forefront of the military thinking of the day. At a time when strategists were preoccupied with horses and sabre, Canada’s irregular military force, the Legion of Frontiersmen, was thinking about aerial reconnaissance and an aircrew training programme! It is interesting to note that Stanley Winther Caws, the “Frontiersmen Commandant” of Lac St. Anne, Alberta (also a South African War veteran and a sergeant in the 19th Alberta Dragoons of Edmonton) transferred to the Royal Flying Corps and flew aerial scouting missions until he was killed in action. Caws and his observer downed two of three enemy aircraft before Lt. Caws was killed by gunfire from the third aircraft. The observer, Lt. Wilson, was forced to land the aircraft (most likely a B.E.2c) behind enemy lines and was subsequently taken prisoner. The Germans buried the former Legion of Frontiersmen commandant with full military honours in 1915. The exact location of his grave was not traceable after the War. Lieutenant Stanley Winther Caws, 10th Squadron, 1st Wing, Royal Flying Corps, who died on Tuesday 21st September, 1915, aged 36 is remembered at Arras Flying Services Memorial, Pas de Calais, France. A massive aircrew training plan eventually came to Canada three decades after Calgary Command’s initial ideas about aerial scouts. It was in the form of the Commonwealth Air Training Programme. The Canadian prairies became the ‘Aerodrome of the Empire’ during World War Two. Exactly what became of the ambitious plans of the Calgary citizens’ and Calgary Legion of Frontiersmen Command’s aerial scouts is not known at this time. Webmaster’s Note. The Founder of the Legion of Frontiersmen was convinced from the earliest days that air superiority in air warfare would decide future wars. A fantasy novel “Chariot of the Sun” that he wrote in 1910, but set ahead in 1980, had little success and has fortunately now disappeared, as it would be almost unreadable today. However, he did describe aerial battles with airships and aeroplanes fighting in fleets like ships of the air. The hero who saves the day for Britain is a Canadian. In 1918 Pocock was attached to the R.A.F. for a short while as a “penguin” (ground officer) where he formed a friendship with Norman Macmillan. In later life he often recommended young men to join the air forces as he felt that would be the future. Article © 2002 Barry William Shandro. All rights reserved. This article may not be reproduced in any form, in part or in full, without prior permission.